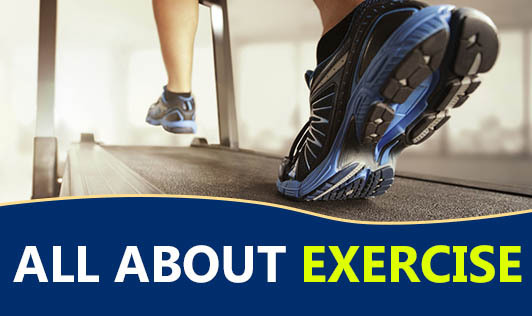 Exercise means any type of physical exertion performed to improve health, body shape and boost performance. Helps to relieve symptoms of depression and anxiety. Helps to reduce your risk of heart disease and certain types of cancer. Helps to increase bone density. The most important step in starting an exercise routine is motivating yourself. The hardest part of exercise is getting started...if you can get that far, you've won half the battle. Remind yourself of your weight loss goals. Think of a future event like wedding or a vacation to get ready for. Imagine how relaxed you'll feel after a workout. Think of your exercise time as the only time you may get to yourself in the day. Think of all the diseases and illnesses your workout could protect you from. If you are overweight, have a high risk of coronary heart disease or suffer from any other chronic health problem then it is important to consult your doctor before beginning any exercise routine. Choose activities that are fun, not exhausting. Add variety and this way, exercises will never be boring. Wear comfortable footwear and loose fitting clothing appropriate for the weather and the activity. Set aside a convenient time and place to do your exercise. This will help you make it a habit. Music when you are working out is a nice motivation. Try and find an exercise partner and motivate each other mutually. Avoid overdoing initially. Slowly increase your exercise intensity and duration.